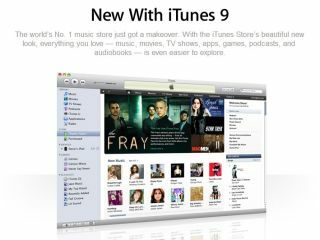 Steve Jobs began Apple's annual iPod event today by unveiling iTunes 9 and a new-look iTunes Store. The biggest news is the much-anticipated launch of Apple's new music format, iTunes LP, marking a return to the liner notes, cover art, lyrics of the vinyl years, as well as multimedia extras. iTunes also adds Home Sharing, letting you transfer media files and iPhone Apps between five computers at home, Genius Mixes for non-stop themed music and some interface tweaks. Apple calls iTunes LP "the next evolution of the music album", although a younger audience might find the promised "rich, immersive experience" more of a throwback to the self-indulgent era of classic rock, especially as the albums chosen to debut the expanded visual features include Bob Dylan's Highway 61 Revisited, The Grateful Dead's American Beauty and Dave Matthews Band's Big Whiskey and the GrooGrux King: iTunes Pass. iTunes Extras provides a similar experience for films on iTunes with features including documentaries, deleted scenes, interviews and interactive galleries, now available for a few blockbusters, such as Twilight, Batman Begins, WALL-E and Iron Man. No word on pricing for these new formats yet, although Apple is also touting ringtone downloads for the iPhone for 99p each. On the software side, Home Sharing lets you easily transfer music, films and TV shows (and apparently iPhone/iPod Touch Apps) between up to five authorised computers. You view up to five iTunes libraries on your home network, see only the portion of libraries you don't already have, import content directly to the different libraries, and automatically add new purchases from other computers. iTunes now lets you organise your iPhone or iPod Touch applications and customise home screens on your desktop, and improves synching by letting you choose to synch music by artists or genres, and photos by events or even faces. Finally, Genius Mixes automatically creates up to 12 'endless' themed playlists from your music library. iTunes 9 is available immediately as a free download at www.itunes.com/uk.